“I didn’t know you were up to the Old 97s,” a visibly delighted Rox said when she read the post for “Timebomb.” And despite the fact that the stars have never aligned for us to see them in concert — and they just played in L.A. a couple of nights ago, but we had a long-planned party that night — they’re probably one of her favorite artists, so she was interested in what other songs I was writing about. So, obviously she was fine with things like “Barrier Reef” and “Murder (Or a Heart Attack),” she was dismayed that I was skipping “Oppenheimer” — just missed the cut — and I had planned not to write about “Singular Girl,” until I got to the version on Rhett Miller’s solo album. “But it’s got one of the greatest lines ever,” she pointed out, and as we both repeated that line at the same time, I realized that I needed to write about it after all. Relegated to a bonus disc that came with the initial pressings of Satellite Rides — which, of course, I bought at Amoeba the week it came out, “Singular Girl” was a bit more country and a bit less rock than most of the other songs from the Satellite Rides sessions, which is maybe why it didn’t make the album? Because it sure wasn’t the songs quality, as it sports one of the best lyrics Miller has ever written. “Talking to you girl is like long division” is, of course that line that we both repeated, and it works on multiple levels. Superficially, of course, it’s a bit of a dis, but then again, it’s always kind of cool and especially when you solve a long division equation, and I think — especially with bassist Murry Hammond supporting that line with an initial “ooooooooooh” and then harmonizing on “long division” — the song is more about how excited Miller is to try and solve the equation of getting through to her. Cos she’s so unique. And with Hammond helping again on the harmonies, there isn’t any doubt that he’s going to take as much time as he can to solve his problem, because he already knows that he’s compelled by forces much more powerful than he is, even if he’s not exactly sure which forces are acting on him. Probably all of them. 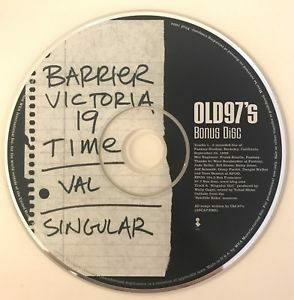 Like “Question,” Miller would re-record this for his second solo album, and like “Question,” it lost just the tiniest bit of its ramshackle charm outside of the context of the Old 97’s, as the new arrangements were, well, actual arrangements, and lacked the spontaneity of the original versions. And so Ken Bethea kicks out a melodic solo in the middle of the song, and then — after a few more “long divisions” and “singular girls” — a slightly more raggedy solo at the end of the song to bring it on home. Talk about long division.